Very comfortable, easy to break in. Stringless concept makes changing shoes in parking lot pre-round efortless. Shoes are light, waterproof. Good value. 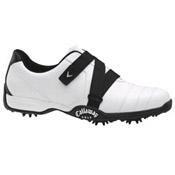 Best store to find them is Golf Galaxy, so far they have had the lowest price. I love mine, but as they say, no 2 feet are alike, so perhaps you will think differently. I def. reccomend trying the concept. The shoe feels just great.